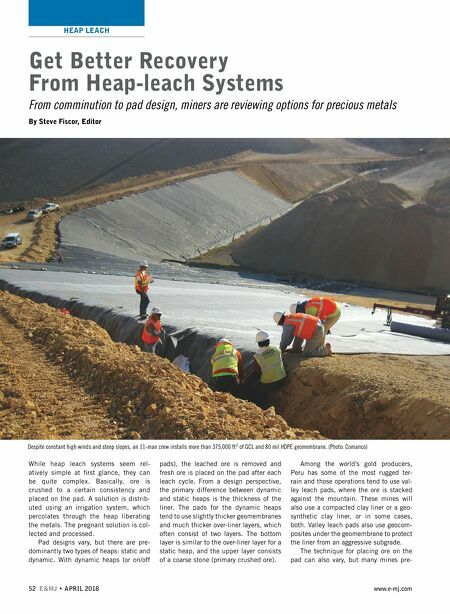 HEAP LEACH APRIL 2018 • E&MJ 53 www.e-mj.com fer slewing stacker systems that build the heap to a consistent level. Large heaps are built in lifts with some mines using as many as three 50- to 60-m lifts. The ideal particle size within the heap is also an area of debate. While most mines rely on traditional secondary or tertiary crushers, one U.S. gold miner is now using high pressure grinding roll (HPGR) technology and getting good results. Heap-leach Pad Design Without proper engineering and design, many variables can affect heap-leach sys- tems and possibly jeopardize the econom- ic viability of the project. With tight con- struction schedules and pressure to begin loading ore on the pad, some engineers and project managers are tempted to skip steps, which could be a costly move. Sharing the lessons they have learned from the design, construction and opera- tion of numerous heap-leach pads world- wide, SRK offered several recommenda- tions for a successful system. The design should account for site-specific conditions such as topogra- phy, climate, geotechnical stability, en- vironmental considerations and closure options. A rigorous sampling program should be developed for characterizing metallurgy, which also assesses ore vari- ability. When selecting the appropriate type of heap-leach pad, engineers should also consider containment and ore load- ing systems. The design should also consider oth- er operations nearby. As an example, fly- rock from a poorly designed blast could easily ruin an exposed liner. Engineers should also anticipate potential lifecycle changes for the operation, especially clo- sure conditions. The solution manage- ment system, i.e., irrigation, collection and water balance, is equally important and it should take extremes into consid- eration, such as dry conditions or high levels of rainfall. Once the system is operational, the system's performance should be moni- tored and compared against the parame- ters considered in the design process. En- gineers should perform a risk assessment at numerous stages of the design process and possibly benchmark performance against other similar projects. 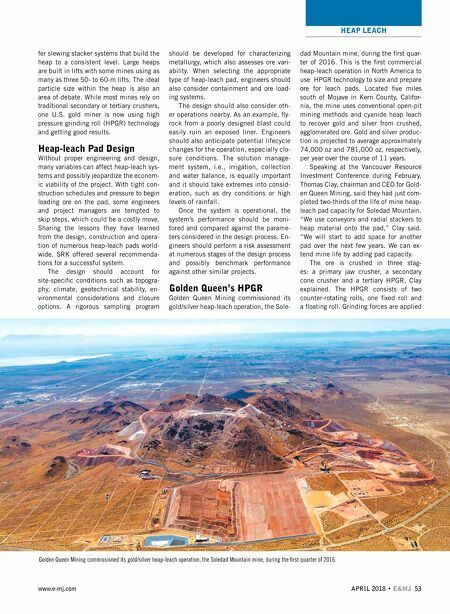 Golden Queen's HPGR Golden Queen Mining commissioned its gold/silver heap-leach operation, the Sole- dad Mountain mine, during the first quar- ter of 2016. This is the first commercial heap-leach operation in North America to use HPGR technology to size and prepare ore for leach pads. Located five miles south of Mojave in Kern County, Califor- nia, the mine uses conventional open-pit mining methods and cyanide heap leach to recover gold and silver from crushed, agglomerated ore. Gold and silver produc- tion is projected to average approximately 74,000 oz and 781,000 oz, respectively, per year over the course of 11 years. Speaking at the Vancouver Resource Investment Conference during February, Thomas Clay, chairman and CEO for Gold- en Queen Mining, said they had just com- pleted two-thirds of the life of mine heap- leach pad capacity for Soledad Mountain. "We use conveyors and radial stackers to heap material onto the pad," Clay said. "We will start to add space for another pad over the next few years. We can ex- tend mine life by adding pad capacity. The ore is crushed in three stag- es: a primary jaw crusher, a secondary cone crusher and a tertiary HPGR, Clay explained. The HPGR consists of two counter-rotating rolls, one fixed roll and a floating roll. Grinding forces are applied Golden Queen Mining commissioned its gold/silver heap-leach operation, the Soledad Mountain mine, during the first quarter of 2016.